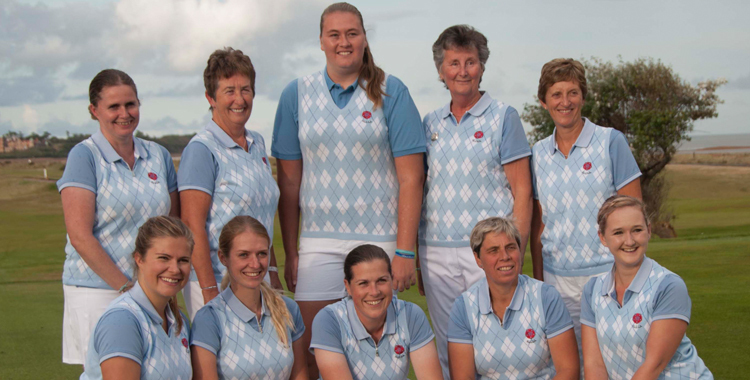 Hampshire Ladies can hold their respective heads up high after a super and challenging week at Felixstowe Ferry in Suffolk. A win against Buckinghamshire and Nottinghamshire means we can claim fourth place in the England Golf National County Finals. My thanks to all the supportive ladies in blue, the girls commented on how they appreciated seeing so many who had travelled so far. Thank you also to all who helped both morning and afternoon, as the week wore on and as some of the players felt tired they really appreciated those who caddied and encouraged them round. Finally my Congratulations to the squad who played. Georgie who played 18 holes each day despite just recovering from a damaged wrist which fortunately was not broken, Kerry our ex Curtis Cup player who always leads by commitment and example, Aimee, who never gives up and can always be relied upon, Kelly who took a week away from work and expertly guided our newer members around the course, Louise who took two days off work at a pressurised time of year and willingly played 36 holes each day, Raffi who everyone is delighted to see back playing for Hampshire, Adrian, a hole in one and passing her driving test makes it a week to remember for her and Sammi who I called upon late and who rose to the challenge fantastically and has played herself into the squad we are building for the future. We wish Georgie our best as she embarks on PGA training in the next few weeks, so there are spaces in the squad to be filled in future years. Finally it was my privilege to Captain the team and spend the week with them all. Team spirit, support for one another and good humour were all in evidence during the week, bring on 2018!